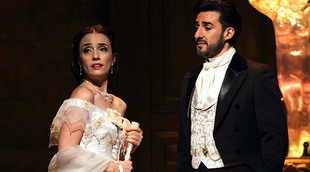 Giuseppe Verdi’s La traviata of 1853 is one of the most frequently performed operas in the world today. Based on Alexandre Dumas, fils’s play La Dame aux camélias, it tells of Violetta Valéry who is a famed Parisian courtesan. Beneath her apparently carefree exterior, however, she is suffering from tuberculosis and her world is shaken when she meets Alfredo with whom she falls in love. They run away together and live off the sale of her goods, but one day Alfredo’s father Giorgio Germont appears and begs her to leave him. This is because Alfredo’s behaviour has brought disgrace on his family, which is impacting on the ability of Germont’s daughter to marry and be happy. Despite loving Alfredo deeply, Violetta shows compassion towards the family and agrees. Alfredo, however, does not discover the real reason why Violetta has suddenly walked away, and everything comes to a head when he angrily confronts her at Violetta’s friend Flora’s party. He eventually discovers the truth as his father also regrets pushing them apart, but by this time Violetta is terribly ill and, although the pair are finally reconciled, she dies in his arms. There is much debate over how autobiographical Verdi’s creation is because he was himself judged by society for living with the soprano, Giuseppina Strepponi, out of wedlock from the late 1840s (they were married in 1859). However, when the chorus suddenly condemn Alfredo for his treatment of Violetta at Flora’s party it is certainly tempting to see this as the composer’s way of getting the people to take his own side. This is the sixteenth revival of Richard Eyre’s 1994 production for the Royal Opera, revived here by Andrew Sinclair, and many subtle touches are to be found within its curved walls. Designer Bob Crowley works virtually every scene around a semi-circular set, with each one employing its own tools and techniques to shed light, and provide commentary, on the action. Act I takes place in a sumptuous Art Deco interior, revealing Violetta’s role as the archetypal fashionable Parisian. The most important features, however, are the doors. Whenever these are open, and people are free to enter, Violetta assumes her frivolous, sociable persona. As soon as they close, on the other hand, she becomes a far more introverted character. Indeed, the end of the Overture sees her sitting thoughtfully to one side, and it is only when the doors open at the start of the Act that she changes. They swing out once more as she moves from the contemplative ‘Ah fors’è lui’ to the carefree ‘Sempre libera degg’io’, in which she reasserts her wish to enjoy Parisian life to the full. Similarly, Act II’s gambling scene takes place beneath an ornate palace roof, its gilded surfaces lying at peculiar angles. Here we find a red bullring and a casino table with overhanging metal light. It is not to be taken as a literal space, but clearly the bullring alludes to the antics of Gastone and his friends as matadors, and creates an appropriate arena for action that all too readily alludes to gladiatorial combat. At the same time, the insertion of the more modern table and lamp under a palace roof may suggest that this form of gambling has taken its place within a far greater history of wealth and decadence in Paris. If, however, the production has always been strong, its sixteenth revival is made truly extraordinary by the quality of the performances. Ermonela Jaho embodies the character of Violetta to an almost superhuman degree, projecting her public persona so effectively that she almost seems conceited, and yet revealing in ‘Sempre libera degg’io’ just how emotionally shattered she feels every time that she hears Alfredo’s voice. Vocally, she is also superb, as her soprano combines an enormous number of nuances to produce an overall sound that feels incredibly clear and impeccably controlled. As Alfredo, Charles Castronovo brings his smooth and expansive tenor to the fore, and yet his sound is raised far above the level of the ‘merely’ pleasing by virtue of the precision and sense of gravitas that he brings to it. Castronovo’s Alfredo is every inch a young, dashing figure whose extreme reaction to Violetta’s apparent desertion is entirely believable since it could be seen as deriving from the petulance of one whose emotions still have a youthful rawness. 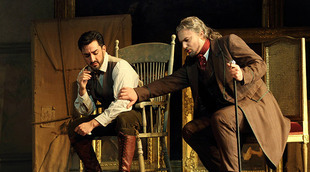 This is Igor Golovatenko’s debut at the Royal Opera House, although he is not new to the role of Giorgio Germont. In particular, he played it opposite Kristina Mkhitaryan’s Violetta for Glyndebourne Festival Opera in 2017 when the pair between them absolutely stole the show. His baritone is extremely strong, broad and well shaped but, as opposed to feeling simply dark and heavy, it has real warmth and lift. He is possibly not the most natural of actors, but his persona works extremely well with the part as he suggests an expectant man who may feel wretched inside at what he is asking of Violetta, but who lacks the emotional ability to show this in any way. Thus Violetta can be on her knees pleading with him and yet he can only respond by continuing to push forward his own agenda. On many occasions, when Violetta and Alfredo confront him, he simply turns his back and walks away from them as he does not have the psychological strength to offer them any other reaction. There is excellent support from Aigul Akhmetshina’s Flora, Jeremy White’s Marquis D’Obigny, Germán E Alcántara’s Baron Douphol, Simon Shibambu’s Doctor Grenvil, Thomas Atkins’ Gastone and Catherine Carby’s Annina, while Antonello Manacorda’s conducting is extremely fine, with the strings’ sound being particularly persuasive. Casts vary over the run with Angel Blue and Benjamin Bernheim singing Violetta and Alfredo for some performances. This production, featuring the cast described above only with Plácido Domingo singing Germont instead of Golovatenko, will be broadcast live to selected cinemas around the world on 30 January, with some venues also showing encore screenings on subsequent days.